A simple vegan chocolate cake is perfect for any occasion, made with basic ingredients. This is really simple, yet very tasty cake. This vegan cake is a good recipe to make any time you need to make a basic chocolate cake. It can easily be customized for different flavors and this vegan cake is great for any type of gathering and non-vegans love it too. 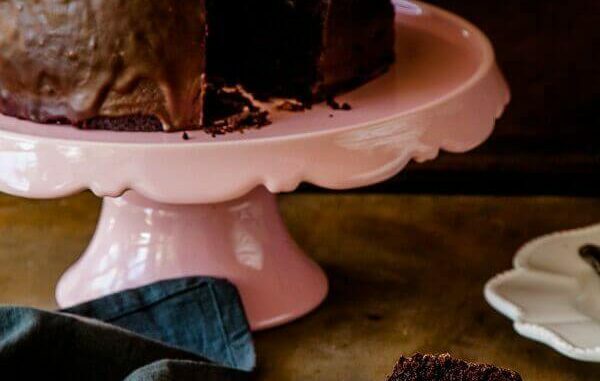 This vegan chocolate cake recipe ticks all the right boxes. It is intensely chocolate without being the least bit sickly. It is rich but not overly and most importantly, it is super easy to make. All you need to do is combine the wet with the dry ingredients to make this vegan chocolate cake. Simply mix and bake. It couldn’t be simpler. The vegan chocolate cake uses just a few basic ingredients you might already have at your home. Baking soda helps it rise and coconut milk binds the cake without eggs, also keeping it delightfully light and fluffy. No one will ever suspect it’s healthier and vegan because it simply tastes like classic homemade chocolate cake. If you’re in the mood for a chocolate fix this quick easy vegan chocolate cake is sure to satisfy! Red Wine Vinegar 2 tsp. 250 g vegan dark chocolate roughly chopped. Preheat the oven to 160 Celsius (315 Fahrenheit) and grease a 23 cm (9 inch) cake tin and line the base with baking paper. Sift the flour, cocoa, baking soda, baking powder and salt into a bowl. Sift again. Combine the coconut milk, vinegar, brown sugar, oil, and vanilla extract in a large bowl and whisk to combine. Add the flour mixture and whisk until smooth. Pour the mixture into the prepared cake tin and bake for 40 to 55 minutes, or until a cake tester inserted into the middle of the cake comes out with almost no crumbs attached. The middle of the cake should also spring back when lightly pressed. Place on a wire cake rack and leave to cool in the tin. To make the frosting place the chocolate and coconut milk in a small heatproof bowl over a saucepan of gently simmering water. Stir until melted and smooth. Set aside for an hour, or until slightly thickened (do not refrigerate), before frosting the cake. Pour the frosting over the cake and gently easy down the sides with an offset spatula. Top with raspberries, if using. If you make this recipe, let me know how it goes. Leave a comment. Enjoy!